You can best reach Halle city by car from the A14 motorway. Take the exit Halle/Peissen to reach the city centre. If you prefer to fly, there are commuter trains (S-Bahn) every half hour that go from Halle/Leipzig airport direct to the city of Halle. Halle city is very conveniently placed on the german rail transport facilities, and is quickly reached by IC, Regionalexpress, Regionalbahn or commuter rail (S-Bahn). 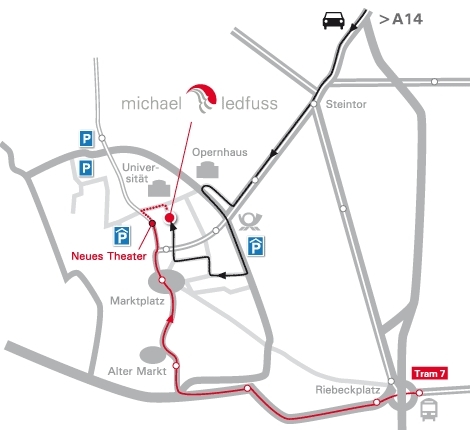 Within the city, you can take public transport directly from central station without transfer to Neues Theater (Tram 7, direction Kröllwitz) and from there you reach my workshop in just 1 minute by walking up the Schulstrasse.